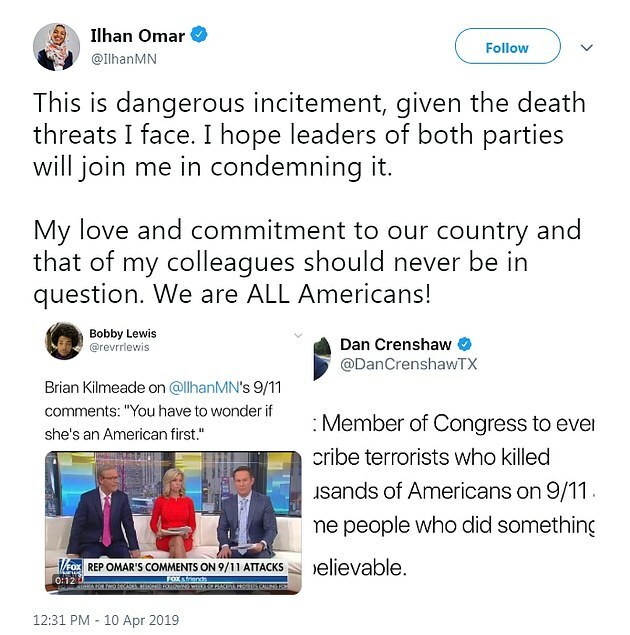 Alexandria Ocasio-Cortez defended Rep. Ilhan Omar Thursday for describing the Sept. 11th attacks as 'some people did something' before being criticized for telling former Navy SEAL Dan Crenshaw to 'go do something about domestic terror'. Omar made the comment at a recent speech at the Council on American-Islamic Relations (CAIR). 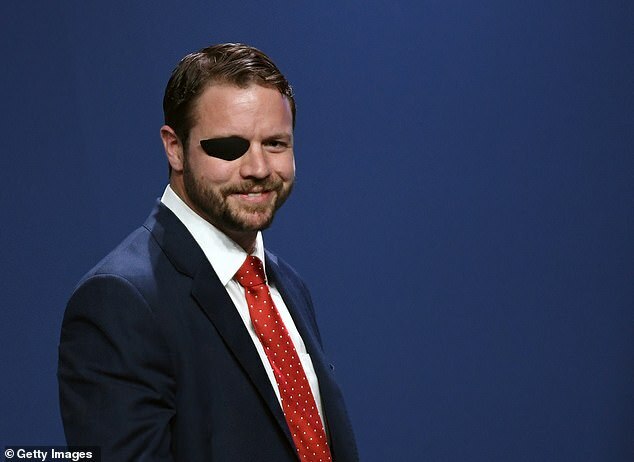 Texas Republican Rep. Dan Crenshaw attacked her remarks on Twitter and tweeted out a short excerpt. 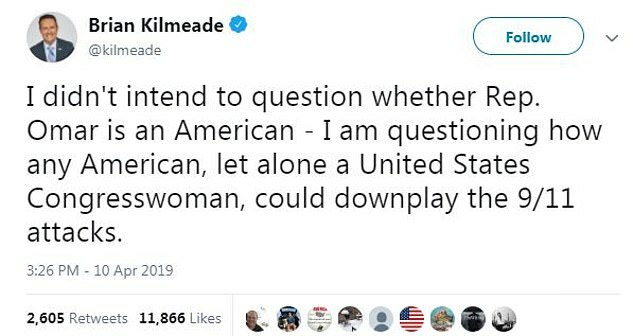 Fox News host Brian Kilmeade questioned whether she was 'an American first'. Ocasio-Cortez hit out at Crenshaw on Twitter for using 'out-of-context quotes' to go after Omar - and also referenced the front page of Thursday's New York Post which attacked the Minnestota freshman Congresswoman. 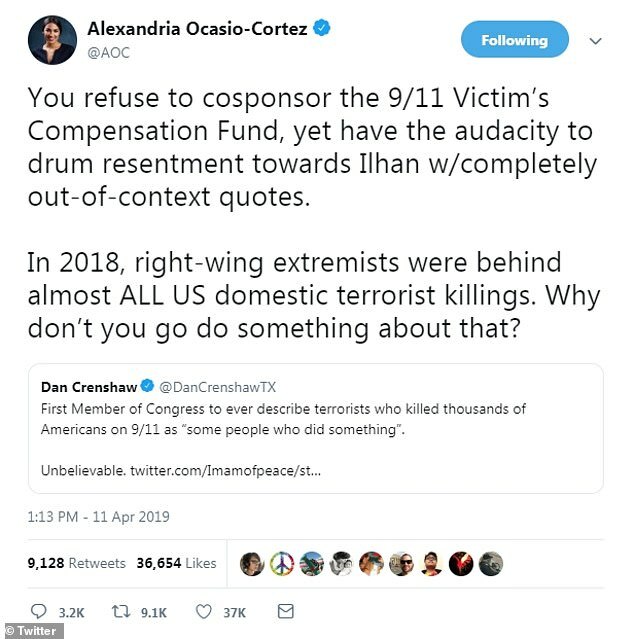 'You refuse to cosponsor the 9/11 Victim's Compensation Fund, yet have the audacity to drum resentment towards Ilhan w/completely out-of-context quotes,' she wrote. 'In 2018, right-wing extremists were behind almost ALL US domestic terrorist killings. Why don't you go do something about that?' she added. 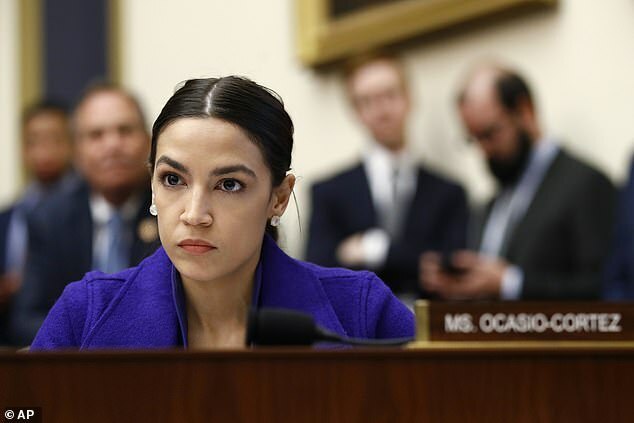 But AOC faced a fierce backlash on Twitter by users who pointed out she was criticizing a veteran. In Omar's full quote, she said: 'Far too long we have lived with the discomfort of being a second-class citizen, and frankly, I'm tired of it, and every single Muslim in this country should be tired of it. She also added in the speech: 'As an American member of Congress, I have to make sure I live up to the ideals of fighting for liberty and justice — those are very much rooted in the reason why my family came here,' and spoke about emigrating to the U.S. as a child who lived in a Somali refugee camp. 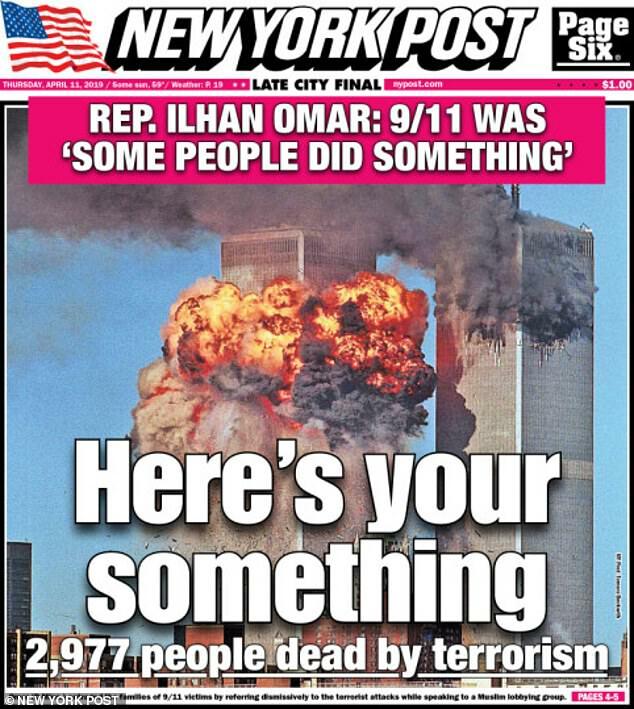 Republicans blasted Omar, one of the first two Republican women in Congress, for the remark, accusing her of dismissing the attacks, which left 2,977 people dead. 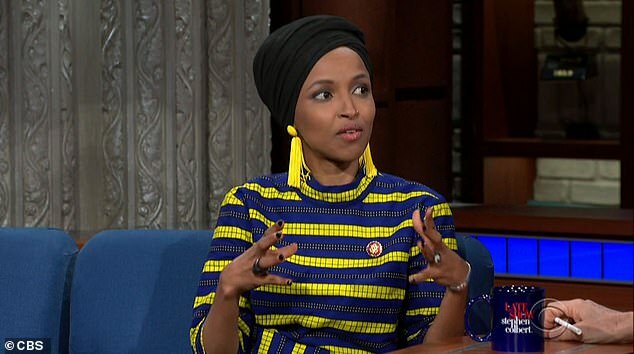 Omar hit out at the 'double standards' she suffers, telling The Late Show host Stephen Colbert that she is 'as American as everyone else,' and has suffered from anti-Muslim discrimination. Omar also told Colbert that when others accuse the Trump administration of white nationalism 'no one bats an eye,' but when she does it it provokes the ire right-wing press. The Minnesota congresswoman was specifically referring to her most recent controversy, in which she was attacked by Donald Trump for calling his senior adviser Stephen Miller a white nationalist. 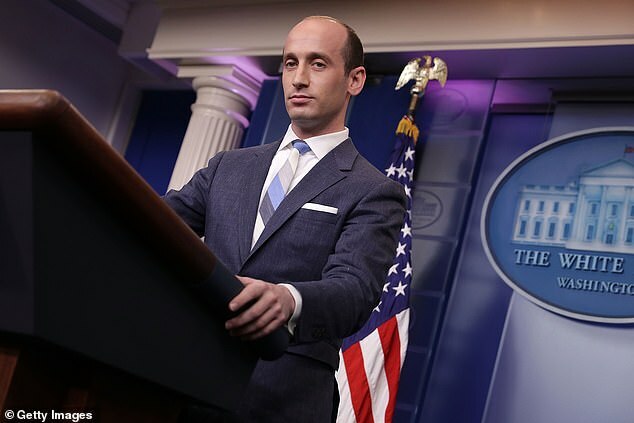 'Stephen Miller is a white nationalist. The fact that he still has influence on policy and political appointments is an outrage,' she tweeted on Monday. 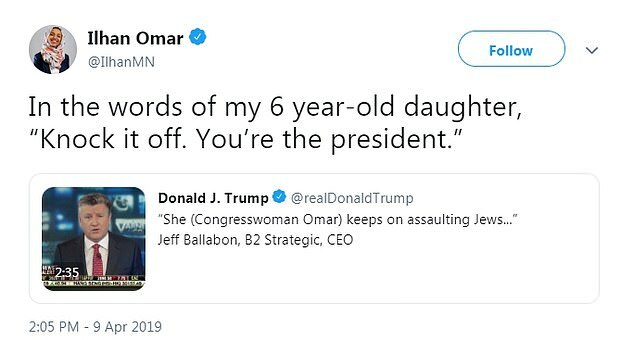 Her tweet caught the attention of Trump, who claimed that Omar was targeting Jewish people – a claim that has been lobbied by many on the far-right since her term began. Colbert noted that he has called Miller a white nationalist multiple times on his own show without ever receiving any criticism of the sort. 'I think because you're a Muslim, you're a woman, you're a person of color, you're given less latitude then someone like me,' he said. Omar said that when a congressman had called Miller a white supremacist last year 'no one batted an eye'. 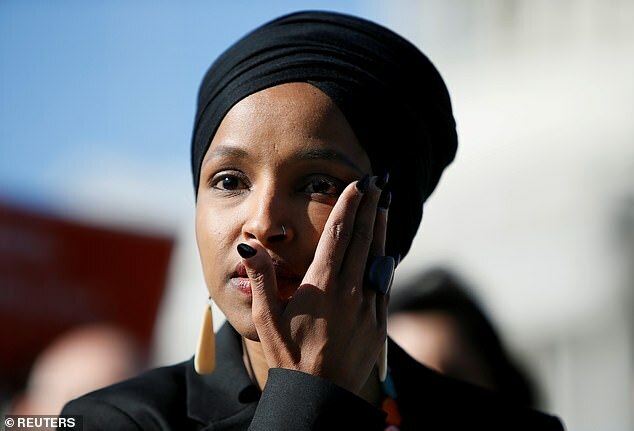 Omar has provoked scathing criticism from right-wing commentators, including Fox News host Brian Kilmeade, who questioned whether she was 'an American first'. 'I expect my colleagues to also say: 'That's not okay', they should condone that and call that out,' Omar told Colbert. 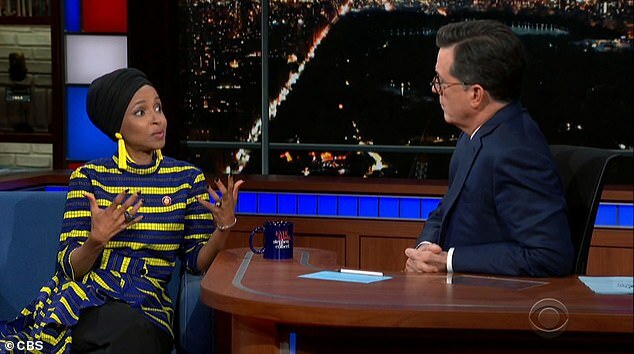 When Colbert asked Omar why she believed she had become a 'lightning rod' for both right-wing media and some fellow Democrats, the congresswoman said the answer was merely her identity. 'If you think about historically where our nation is right now, there are many members of our community, their identities are lightning rods,' she said.